I love my slow cooker. 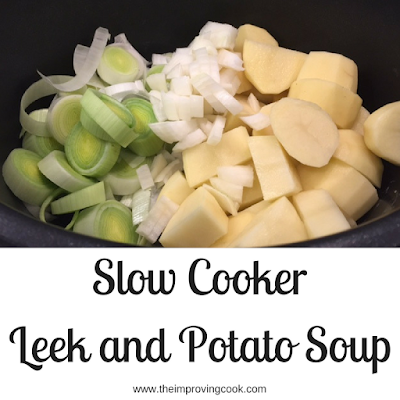 It's amazing for batch cooking, economical to run and saves a lot of time when I'm busy. If I'm feeling super-organised, I can fill in with ingredients in the morning, leave it on low and then go off to work. Sometimes I leave it cooking overnight if it's something for the freezer, but then it's a bit strange to be woken by delicious dinner smells in the morning! I originally asked for a slow cooker as a birthday present, but I was a bit taken aback when I opened it and saw how enormous it was for my postage stamp-sized kitchen! Evidently, mum had asked the sales lady what size would be good and she sold her the largest one they had, which serves 6-8 people; not exactly suitable for someone living on their own. Still, it's excellent now I have a normal size kitchen and I'm so keen on batch cooking. I use it a lot. When I first starting using the slow cooker, it seemed to be just a lot of casserole recipes that I was making, and I wanted something a bit different. 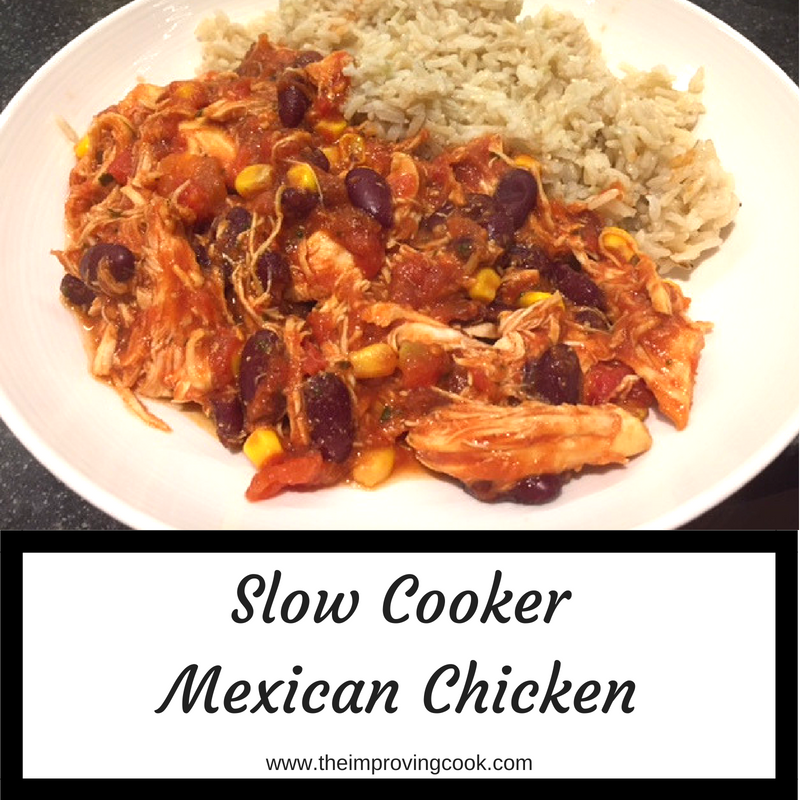 This Mexican-style slow cooked chicken recipe is really tasty and can be thrown together with things that you would probably have in your cupboard already. It has lots of Mexican flavour from the chilli and the cumin and it's a really substantial meal with the combination of the chicken and the kidney beans. What I really love about it though, is that it's just so versatile in terms of how you can eat it. We have eaten it lots of different ways- with rice, or over a jacket potato, in a wrap, or in the Old El Paso "Stand n Stuff" boat shaped tortillas. It freezes really well, so I often make a big batch for busy weeks. Once you try it, I guarantee that it will go on your list of regular dinners! 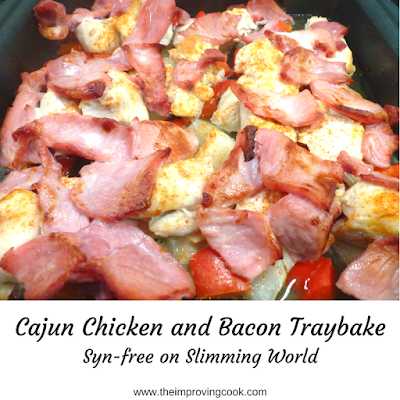 If you are on Slimming World, this recipe is syn-free. Would you like to join my UK Recipe Sharing Facebook Group for tips, ideas and recipes? There's a printable recipe card at the end of this post. Lay the chicken breasts on the bottom of the slow cooker and cover with all the other ingredients. Slow Cooker Mexican Chicken- a spicy, slow cooked chicken dish, perfect for family meals and cooking in large batches for the freezer- syn-free on Slimming World. 1. Lay the chicken breasts on the bottom of the slow cooker. 2. Chop the onion into small chunks and the red pepper into 2-3 cm pieces and add to the cooker. 3. Tip the tinned tomatoes, kidney beans and sweetcorn in on top. 4. Add the garlic, coriander and spices and then stir in the stock, making sure everything gets combined well. 5. Add some seasoning and the jalapenos (if using). 6. 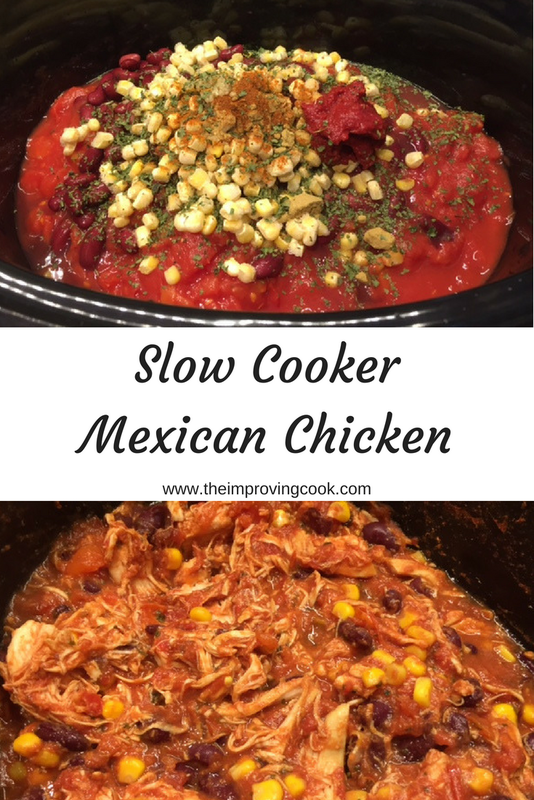 Put the lid on the slow cooker and set it to low (7-8 hours). 7. When cooked, the chicken should shred easily. Use a spatula or wooden spoon to shred it in the slow cooker and mix it through the sauce. 8. Sprinkle the grated cheese over each portion if using. Serve the Mexican chicken with rice, inside standing tortillas or over jacket potatoes. If you want to turn it into a full Mexican feast, serve with guacamole, salsa and sour cream. Nutritional info does not include cheese or jalapenos.